I found Liana and her gorgeous pillow covers at WoodyLiana. AND it turns out…she lives near me! She runs a top quality, single person shop AND has a husband and two small boys. These pillows were made for me recently…look at that hidden zipper. The pillows covers came beautifully packaged. In fact, Liana delivered them to me. Liana often gets decorating questions emailed to her, but prefers that her customers get professional advice. She says “A single hour of consultation with a trained professional can cost as much as a single pillow, and will be much more valuable than all the time, stress and wasted money you’d spend on experimenting.” But you could submit questions here for a follow-up post. 1. 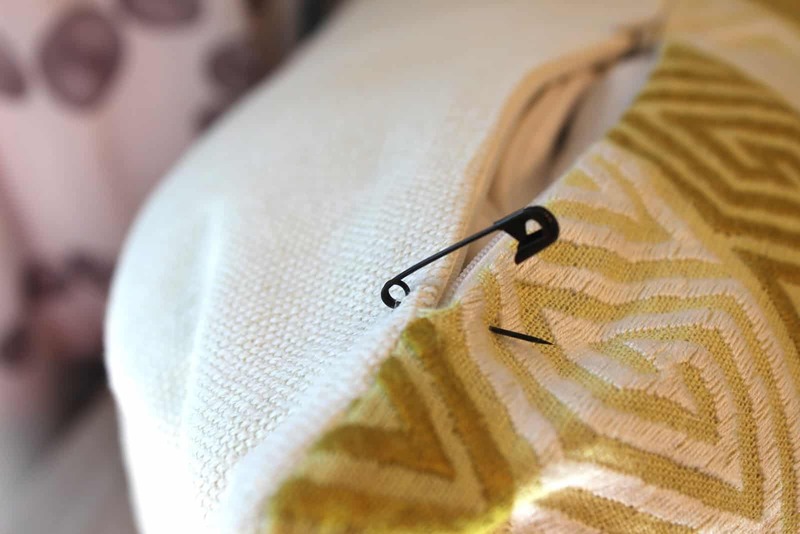 Put safety pins at either side of the zipper to reinforce it. Liana says that no matter the quality, zippers can be damaged during this process. (Use down and feather for all indoor pillows–more plush–of course). 4. Cinch on both waists to push the feathers towards the corners. Let’s play with her pillows at my house! And now for the $100 Give-away! in stock at her Etsy shop. International entries are welcome, too. Just pin your favorite photo from her shop. And/or become a follower here or on Facebook and leave a COMMENT BELOW (make sure I have your email address). Note: If you are receiving this by email, go here to comment at the end of the post. Note: $100 store credit expires in 60 days from date of drawing. You will love her pillows. Look for my next post for more wintery pillows and Liana’s tips. Beautiful pillows! I especially love the blue chevron lumbar pillow which I pinned. Thanks for sharing. Her pillows are amazing-I'll take one of each! After I wiped the drool off my keyboard I pinned the cheetah print pillow. I didn't want to pin the ones I actually want so no one else would buy them. WOWZA this is the most gorgeous group of pillows ever! I pinned and already liked… please please pillow god pick me for the winner!!! Wow!!! Just found your blog over the past week….live just a bit south of you in San Clemente. 🙂 Lido is very dear to me because my grandparents had a home there for years and years. I am a Newport Beach native and have spent so much time there! It's a lovely place. I, too, am a pillow junkie. Not everyone knows what an amazing source Etsy is for high-quality pillows. I haven't seen this shop before, and I am very impressed! Would LOVE to win these pillows!!! Thanks for the very generous giveaway! Remember I need your email address to tell you if you win! Not only did you change the pillows, you changed the flowers to a fern. I pinned, and liked. Great shop and great giveaway, Mary Ann. I follow you on facebook and your blog, and I pinned my favorite. Mary Ann you're killing me this morning! 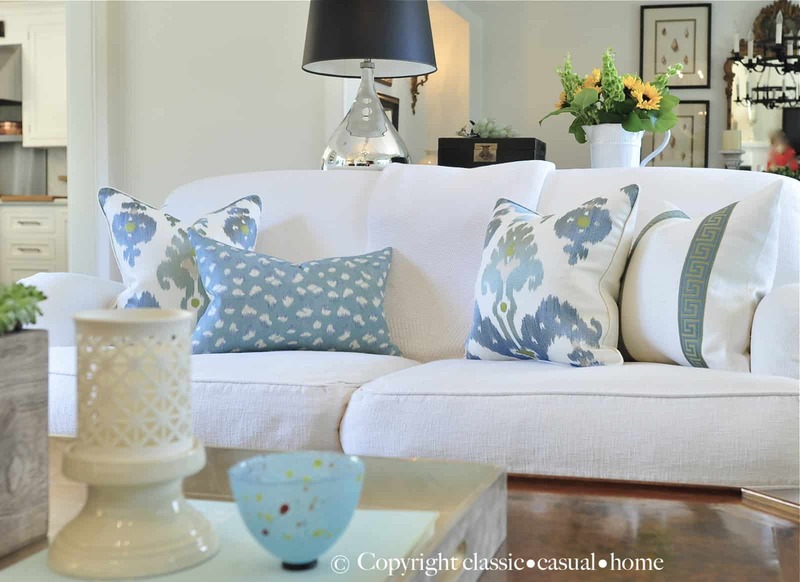 Two of my favorite things….your house and Liana's beautiful pillows! Woody Liana has long been one of my favorite shops on etsy…fabrics and quality second to none! P.S. I pinned the Citron Betwixt…was I supposed to tell you that? Love it! These are so fresh an fun. Love to give this to my daughter so she can pick out some pillows for her new apartment! Oh I love these! I just pinned the magnolia pillows. How pretty! Your daughter is so funny, too (she sounds quick witted!). I am hoping I win, as I would love to use these in the dining room at the end on each chair. Beautiful! I'll be scanning her site for sure. My email is tomharvill@comcast.net. Adore the Jaipur Document it will mix with some pillows I have!! It is so cool Mary Ann when You find that a blogger or source is nearby! I would love to win some credit from her store! So cute! I pinned a photo on Pinterest! As Karen said "Mary Ann….You're killing me! WOW……her pillow are SO divine…I can hardly stand it! Her fabrics and workmanship are amazing and I love the tips on stuffing a pillow (though I did know the part about folding the insert)! 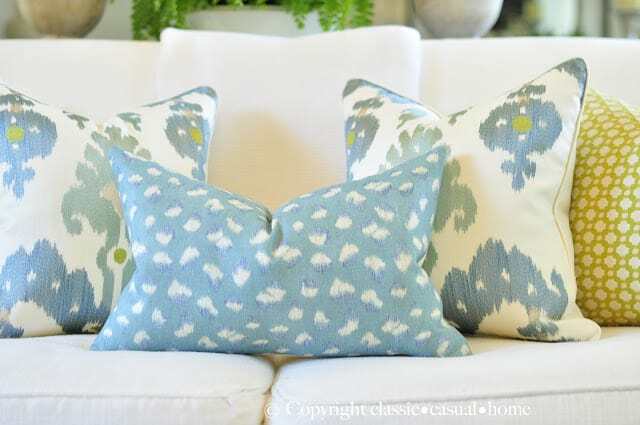 I'm now obsessed to make more pillows and I adore the ice blue and citron color combo! Thanks….now I'll have to go on the hunt for more fabrics!!! And YES….I immediately noticed Liana's bracelets….too chic! P.S. I just went to Esty and saw her amazing collection of pillows and fell madly in love with about 20 pillows. Love Sinhala in Bittersweet and the Nebaha in Citron. But the thing I was most amazed by are her great prices….don't know how she does it! What a fabulous find Mary Ann! I have ordered from her before and was so impressed with her work! I love her pillows…and have ordered from her! She is the best!!!!! If I don't win this then I am gonna cry real tears…. :) Off to pin…..
Beautiful pillows – I can't believe how they can totally change the look of a room! I would love to win a certificate for Woody Liana's store. 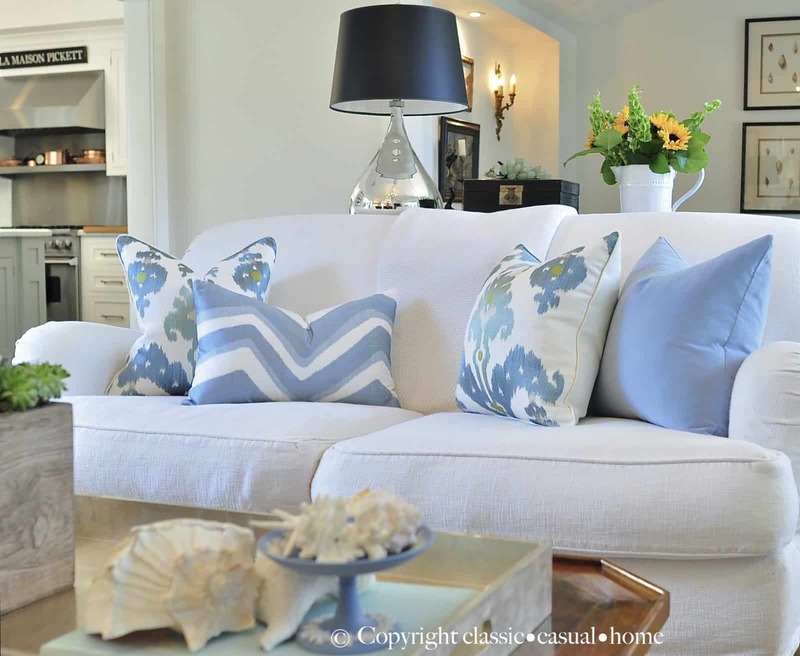 I love the way she photographs the pillows showing ways to group them on your own sofa! Beautiful fabric choices and superb craftsmanship! oops! my email is leeannburkhart60@gmail.com! I've pinned and am already a member here. Would love to own some of these beautiful pillows. I like the green and white medallion pillow. Gorgeous pillows! The Schumacher Nebeha is so unique! Thank you for this generous giveaway. sunmumsie at yahoo dot com. I have checked out Liana's beautiful pillows out many times on Etsy. I pinned several, my favorite is the Lee Jofa Indian Zag. And I love your pink and green pillow which I did not see on her site. 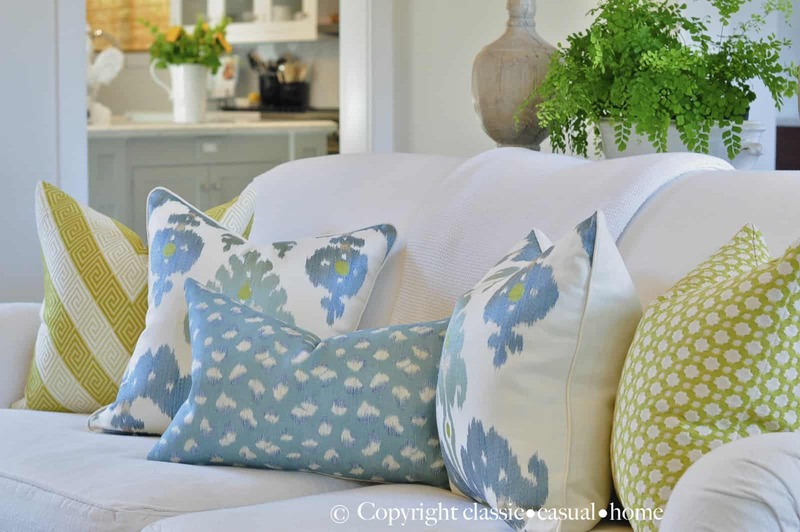 Her pillows look great in your pretty home! Really beautiful fabric choices and amazing workwomanship! 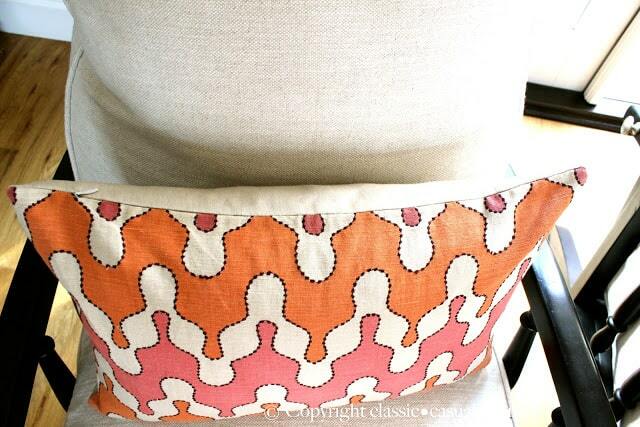 Oops, meant your pink and orange pillow with black stitching, who is the maker? This is what I call pillow perfection….LOVE them. They look fabulous, your choices were spot on. I get so excited with pillows…and you are right such a quick and easy way to change things up. I too love the plushness of a wonderful down pillow, the fuller and squishier the better!! Thanks for sharing! beautiful pillows! I love all the different looks just by making small switches. I'm a follower already. I'm off to check out her site now. thanks! Is there a synthetic product you can recommend that has the quality feel and resilience of feather/down? I pinned the Kelly Wearstler pillow because I love it; but it doesn't match anything I own. I also love the chevron bar silk pillow in marine, and it looks like it would be a great match in my living room. Momma needs a new set of pillows. I found her store on Etsy awhile ago and love all her pillows and how she puts others with to show all the options. Definitely one of my favorite Etsy shops! WHAT A GREAT GIVEAWAY!! I pinned, and followed on FB!!! I am already a follower here! Love the new look on your sofa!! Such beautiful colors. Pillows are like crack aren't they? Very addictive! I adore the Lulu chant reverse in charcoal. her etsy shop is adorable. As is your blog. your styling is wonderful. great giveaway. Gorgeous! 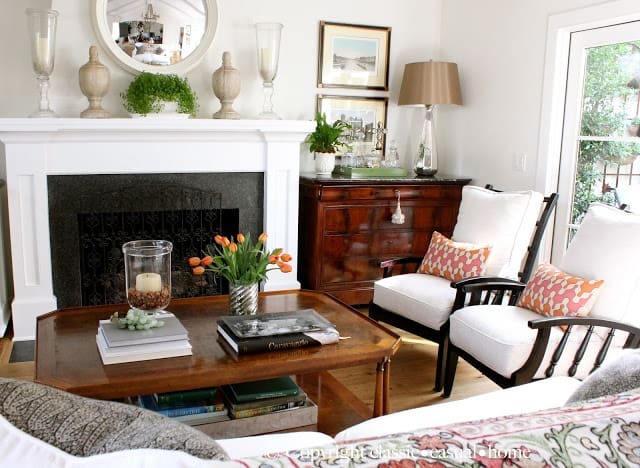 I love how a pillow changes the look of a room completely. Already a follower and off to check out etsy site. Thank you! I am already a follower of your blog. I love the beautiful pillow giveaway. Please include my name. Have long been a follower of your blog via GFC! Thanks for hosting this really nice giveaway! 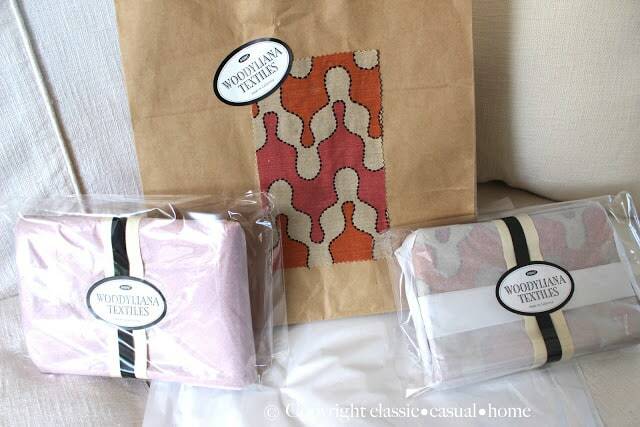 I pinned the Windsor Smith print pillow. Adore it! And I had already "liked" you on FB!!! Beautiful pillows and a fun Giveaway! I'm already a follower and like you on FB. 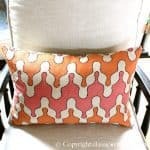 I pinned the Schumacher Ikat pillow: love love! Love the pillows and your blog! You both have great taste! Love pillow talk…most of us do. Pillows really add I love making them, designing them and with them, gifting them to clients, friends and family. Having your pillow dealer close is a fabulous thing lol! I follow, pin, comment and hope to win! Like you on FB and follow your blog. The pillpow covers are all gorgeous! Love when you have neutral furniture so you can add new pillows and get a whole new look. looks great! Thanks for sharing this technique! I loved the Schumacher BETWIXT pillow cover in Indigo in Woody Liana's show but there are so many wonderful other ones also. I like your Facebook page already and follow your blog. You're gonna sell a lot of cushions for them – yours look absolutely stunning and I want to change my colour scheme to match. How beautiful are those colours! Her pillows are beautiful! I pinned the Quadrille Potalla pillow. Yes, I'm a happy follower of your blog. And now following on Facebook. Oddly, I've been admiring her pillows the last several weeks and check in on her inventory as of late. Thanks for the chance to win as we're all on budget! Bonus to have stumbled on your blog too! I have a passion for design too and learn from folks like you. Just recently launched my own small business and blog. I LOVE Woody Liana pillows. I always have a wish list going for what I want to purchase next from her. I so want two 22" chiang mai pillows in the aquamarine colorway with the same fabric on front and back! I may have to give up a kidney to get them but am confident it would be worth it! No one gives more attention to the finishing details than Liana, she is hands down the best. P.S. love your mercury jug lamp, now its time for me to search your blog for the back story to fin out if the lamp shade is black or navy and where you got it! just pinned the belgium velvet pillow cover in teal, so beautiful. And I pinned one of the gorgeous pillows! Love these pillows! 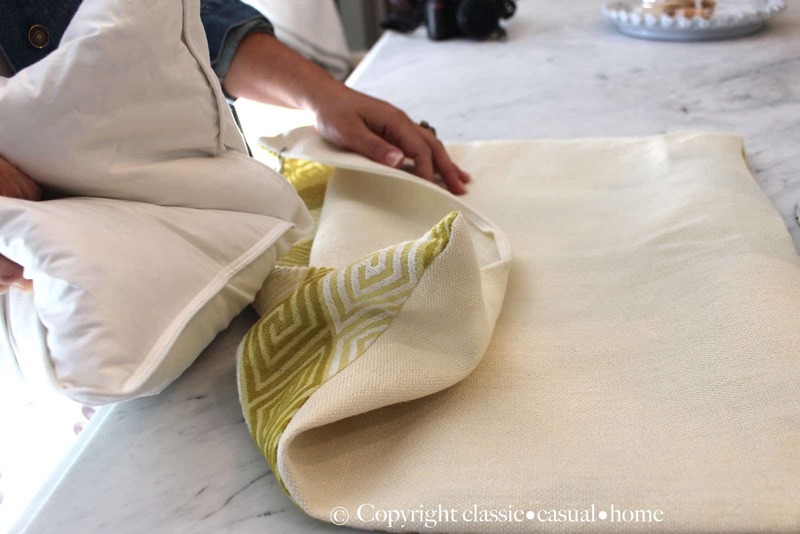 Thank you for giving us another source for custom pillows, always looking for a great workroom! Love Love these pillows. Thanks for this shop find! I pinned my favorite 20"sq. 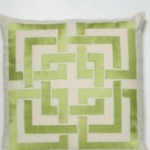 Schumacher DARYA Ikat pillow cover in Jewel. These pillows are beautiful and look like they are also beautifully made. Loving the tips for stuffing too. I am going to pin some of my favorites now and follow,but I may have already. Her pillows look fabulous on your sofa (beautiful color scheme!) and I really appreciated her tip about the safety pins. I just learned that lesson the hard way). Great post! I've ordered pillows from Woody Liana and they are, indeed, top notch quality. 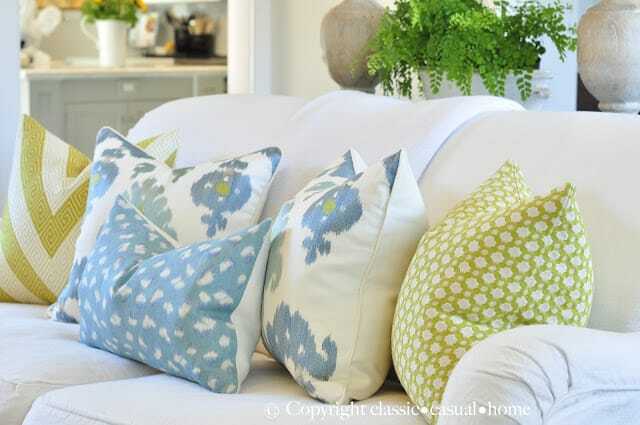 I wouldn't have easy access to the designer fabrics she offers and the workmanship of the pillows is outstanding. So glad to see her featured! Wat beautiful pillows, so many beautiful combinations! I love greek key and the Nebaha in Sky pattern has a nice twist. I can see pairing it with the plush velvet and york castle pillow. I never knew how to stuff a pillow cover before! I'm going to have to pin this. That is beautiful workmanship on those pillows. So often you see pillows on Etsy with no welt or made with no regard for the pattern (to maximize fabric). I would love to win this gift certificate. In the meantime I'm going to add her shop to my favorites. Beautiful pillows and so well made! I love these pillows! They're beautiful and stylish. Thank you for sharing these useful tips and for the great giveaway! PS: I'm a follower and I've pinned one of her pillows. Love this post and your appreciation for gorgeous pillows! Thank you for introducing us to this wonderful pillow source, and how fortunate you are to live so close to each other too! Wishing you a most wonderful Thanksgiving. I just "liked" Woody Liana on Facebook! Such beautiful pillows! I have been following for 1.5 years and have ordered from her in the past! What awesome taste she has! I'm pinning carnival pillows because I'm thinking about them for our bedroom!!! I just found your blog via Between Naps on the Porch. Those pillows are gorgeous. I could see how you have become addicted. I not only liked her shop on FB, but I also pinned a couple pillows on pinterest. This came at a great time as we've been renovating the family room and I've been wanting something different to update the couch etc. Of course I follow your wonderful blog! Liked you on facebook as well. Love her pillows so much! Just love the pillows. Great giveaway! I love her etsy site and ALWAYS need ( want) new pillows. Im constantly in search of the perfect pillow groupings. I have her etsy shop as a favorite of mine. I am building a new house and I would love to win! Love your beautiful and fresh living room! I have pinned two of her pillows here: http://pinterest.com/mixandchic/pillows/ and I am also a follower of yours via GFC! Great giveaway! Seeing your choices of pillows has always been one of my favorite decorating things. I think I commented on your other post about the pink and orange pillows. They might have even been my inspiration for my party this Saturday! Coinkydink? I think not. :). Have a very happy Thanksgiving, Mary Ann. I love so many of her pillows but I think nympheus is my favorite. I love all of her pillows…and they look so beautiful in your home. I pinned a few and also the photo of "how to stuff a pillow" under useful…who knew? I hope I win!! Fabulous pillows. I just pinned one of my favorites – the Fuji modern one. I "liked" Liana on Facebook and follow by email. Crossing my fingers – these pillows are wonderful. such a beautiful etsy shop! i fell in love with so many pillows i'm not sure what i would pick if i won! pin&follow both! 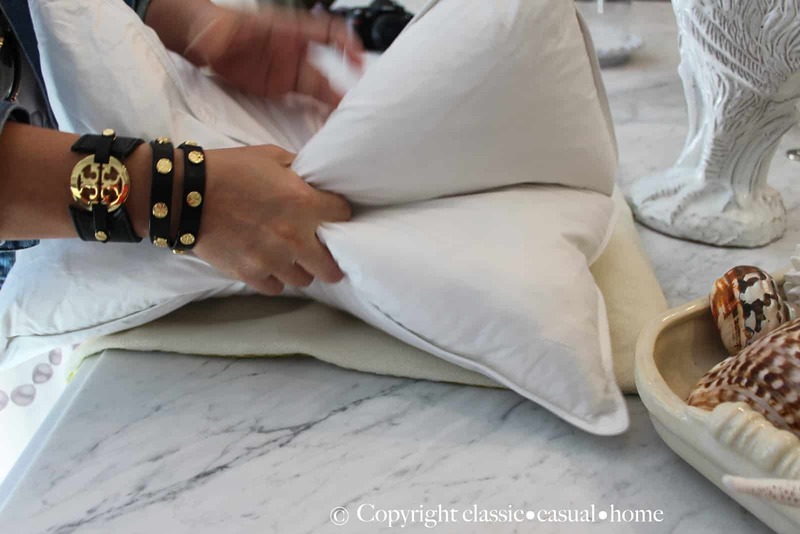 Such good information on how to stuff and care for pillows! So many beautiful pillows to choose from. I think that I would LOVE the Schumacher Avebury Floral Vine pillow for my guest bedroom! I also follow you on FB and email! These posts about pillows are great. I actually just pinned both posts on pinterest – these will became great know tos when I get around to cleaning my inserts and buying new covers! My favorite WoodyLiana pillow is the BETWIXT pillow cover in Chartreuse – love this fabric! 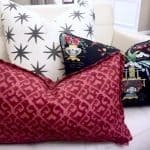 I have been stalking the Quadrille zig-zag pillow but can't decide between that and the pinstripe belgian linen velvet one, but now that I saw your Vervain Ishtar pillows on furniture, they've made my top 3! I've yet to convince my husband we need more furniture so I can buy all of them :)I also liked the tips on caring for/cleaning pillows. Her work is impeccable and I would love to have one of her pillows – fingers crossed! I am a follower of your blog. I would love to be a winner of one of these beautiful pillows. I love all of the beautiful pillows and could use one in my bedroom. I have pinned the Windsor Smith RIAD pillow cover in Indigo. Such beautiful quality pillows. Thanks for sharing such a generous giveaway. I am a follower of your blog! I'm in love with these pillows and your blog! WoodyLiana is one of my favorite stores on etsy – Happy to have found your blog! Love Liana's pillows. I have purchased a couple previously, and they are fabulous! I pinned two different ones- so hard to choose. Pillows are gorgeous! Thank you for the give away! The pillows are beautiful and wonderful to receive the tips for stuffing and refreshing the inserts! I pinned a couple of my favorites (so hard to choose!). kpwl.lee@gmail.com Thanks for the giveaway!! She really has beautiful pillows. My fave are the blk velvet with pinstripe. I just recently discovered her shop on etsy! I just love all of her pillows. She has such a good eye for fabric/pillows! Hi! The giveaway has ended now. Thanks for your interest! Thanks for the introduction to her wonderful pillows. I know the giveaway is over but I am so happy to have found her!